Today Polyscience made the demonstration that a non stired water bath cannot be as efficient as an immersion circulator. It is funny to see that Polyscience directly mentions Sousvidesupreme in the TAG of the article. 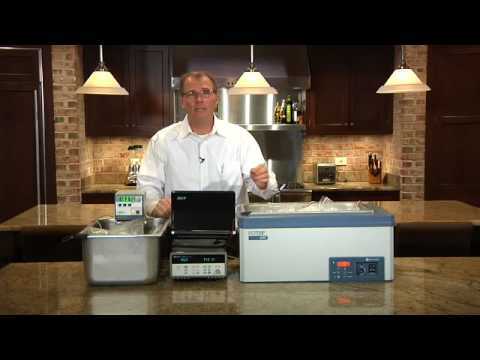 Polyscience video indicates clearely that a non stired water bath has a longer response time to reach the desired core temperature. Therefore, it is obvious that Douglas Baldwin cooking tables sould be used with care. Douglas Baldwin indicates in the Pratical Guide to Sous Vide “With all these digital controllers, I highly recommend setting the temperature offset (measured near the temperature at which you wish to cook) using a high quality digital thermometer. Indeed, at the default settings the thermistors used in the above controllers can easily be off 2–4°F (1–2°C)”. Good catch on the Sous Vide Supreme tag. I also think it is important to note that they put in a lot of cold chicken breasts into a small amount of water compared to what most people do at home. Their study is definitely important for professional environments. Very interesting indeed. The whole point of those sous vide gadgets is extreme precision, otherwise you could just use a crockpot. Yes it is about precision. But no, you can’t use a crockpot. Sous Vide is also about really low temperature cooking, and most crockpots are too hot even at their lowest setting (which probably doesn’t get lower than 175F). Preston made many valid points in his demo. 1. Non-stirred bath’s response time can be improved via adjustment to the controller’s PID settings (e.g., a narrower P band) and thermal transfer characteristics can be improved via better insulation. Both baths as demonstrated by Preston have one thing in common: inadequate insulation. Yes, I am in total agreement: stiired bath is always better from a temperature uniformity perspective, but on the other hand, stirring with no insulation as pointed out Jean-François’s well thought out energy study is also bad too especially when you are cooking a 72-hour beef ribs! 2. FMS is very concerned about food safety. On the statements as quoted by Jean-François, we are referring to people who are not SV professionals, they need to take a more cautious approach to SV cooking. More (temperature and time) is always safer, if you are not sure. 3. A portability pot as pointed out by Preston is very valid too. We totally agree with this and it is often overlooked by many SV equipment purchasers. I think that stirred and non stirred bath have both their usage, You would use a non stirred bath for ingredients that give you more leeway when it comes to precision say vegetables, which are some times cooked sous vide in a steam oven which doesn’t have the same temperature precision a Immersion circulator has. but you would use a immersion circulator for meat or fish. if you can’t afford both which is the case for most people I would always recommend a stirred bath. Can you elaborate on the stirring with no insulation being bad? Is that just from an energy consumption/cost perspective? Yes, stirring with no insulation is bad from an energy perspective. IC is excellent to achieve temperature stability easily at the expense of energy usage. Natural heat loss (cooling) helps IC to achieve temperature stability faster too. IC with the heater immersed in water also makes heating-up response much faster as demonstrated by Preston. The most desirable cooker is a bath with good insulation but you need heating and cooling control to achieve temperature uniformity. Polyscience and all other scientific equipment manufactures (like Hart, Julabo, Grant,…) have the technology to achieve that but it is very expensive solution. We need a new technology to achieve temperature stability, energy efficiency and port portability and yet affordable. We need a paradigm shift!! 18 hrs of cooking @65C: 4.37kWh – that’s very good. It would be great to know how that compares to electric ovens though. SousVideMagic/Tiger Rice Cooker (12L) uses about 1kWh for 24 hrs of operation at 55C set temperature. In other words, it uses half the energy and operate for 3 times longer. But you are right, sous vide cooking is more green than conventional oven cooking. I happen to have bought used the same Fisher waterbath shown by Preston and was amused when I saw it in the video. Just wanted to mention that it is completely insulated – there’s 1 inch fiberglass surrounding the inner tank. Interesting to see that the immersin unit performed just as well without insulation; I think it’s time to check ebay again for a used one and upgrade. I think for the home cook the portability argument doesn’t matter much. I found that my 2 large stock pots were too small for an immersion circulator. I used initially a large Cambro (12 by 18, > 4 Gallon), then switched to a smaller (10 by 12 by 6) but now realized I might need the large one. Fact is, yes you can put the circulator away but what do you do with the tanks? If I use the 1 gallon ziploc in a small tank it creates sort of a barrier for the water flow. Like a chubby man in the tub I thought. I moved it around and the circulator didn’t register a change in temperature so I am not sure about the relevance – will test with a thermometer down the line – if the bag creates a full barrier in the tank there should be a difference I would think. Pot portability is very relevant. 1. The pots can be easily cleaned and stored away including the IC. 2. Depending on what you are cooking, you can switch pot sizes and use them to chill and store pouches. For SousVideMagic users, nobody is tied to a particular cooker. Our best customers are IC users, because they can offload their long term food loads to SVM to save energy and IC space. An unstirred bath using the correct temperature conrol device will achieve better than ±0.2°C stability which is totally acceptable for sous vide cookiing. Since early tests were done with primative controllers,published results are misleading. New state of the art sous vide baths use controllers which achieve better that ± 0.2°C stability.